You can catch the train that runs from Boston to Fitchburg at the South Acton Commuter Rail Station. The MBTA (Massachusetts Bay Transportation Authority) regulates the train system. Use the schedule for the Fitchburg line, formerly called the Acton/Fitchburg line. Find information about Acton-area transportation services at http://www.crosstownconnect.org and http://www.minutevan.net. The Cross-Acton Transit (The CAT) is an hourly fixed-route bus service that links residential areas, businesses and the South Acton Commuter Rail station together. The service runs from 8:00am-6:00pm Monday through Friday. See the schedule for designated stops and times. You can flag down the CAT bus to stop at any point along the fixed route. The MinuteVan Rail Shuttle connects offsite commuter parking at the West Acton Fire Station and the Mt Calvary Church with peak hour trains at the South Acton MBTA Station. See the Minutevan schedule. The MinuteVan shuttle service is a call-oriented system with several programs including: The MinuteVan Dial-a-Ride for all residents, along with the Council On Aging Van, and the Road Runner for seniors and disabled. The Assabet River Rail Trail is a multi-use recreational rail trail that will pass through Marlborough, Hudson, Stow, Maynard and Acton. On September 19, 2015, MassDOT advertised the Acton-Maynard trail project for construction. The bidding closed on February 23, 2016, with the winning bidder selected in April-May and construction starting in June-July. Once construction starts, it will take 24 months to finish. On February 23, 2016, bids from six construction companies met the 2:00 PM deadline, ranging from $6,719,972 - $10,445,269. The Bruce Freeman Rail Trail is a multi-use recreational rail trail through Lowell, Chelmsford, Westford, Carlisle, Acton, Concord, Sudbury, and Framingham in Massachusetts — following the 25-mile route of the old New Haven Railroad Framingham & Lowell line. The Spring 2016 Newsletter includes updates on Phase 2A (Westford, Carlisle and Acton), Phase 2B (Bridge over Rt. 2) and Phase 2C (Concord). It also has information about progress in Sudbury and news about maintenance in Chelmsford. The Commission on Disabilities in Acton strives to build a solid community of people with disabilities to increase our visibility and lobbying power and to decrease the sense of isolation that comes from living in a rural are. Over 1650 acres of Acton's land is preserved for conservation with walking paths. 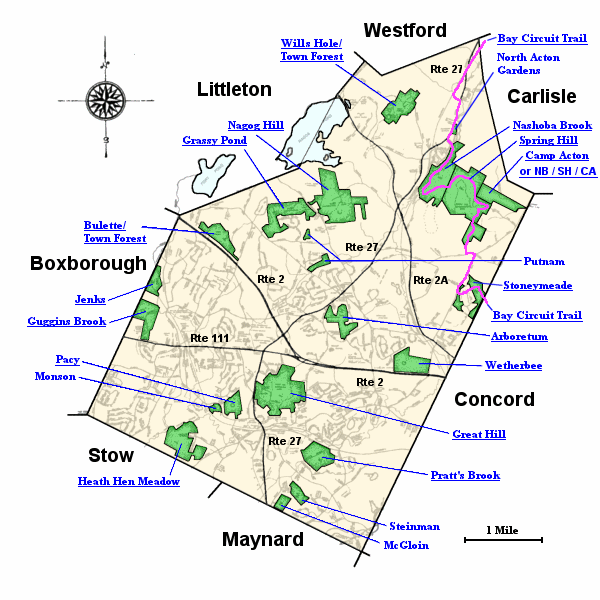 The Acton Conservation Lands website, sponsored by the Land Stewardship Committee of the Acton Conservation Commission, includes maps and information. The Town of Acton Complete Streets Policy will focus on developing a connected, integrated network that serves all street users. Complete Streets principles will be integrated into policies, planning, and design of all types of public and private projects, including new construction, reconstruction, rehabilitation, redevelopment, repair, and maintenance of transportation facilities on, adjacent to, and related to streets.